As promised in the previous post, here's a quick and easy recipe you can make for the holidays. In fact, this is actually one of the dishes that I'll be making for an upcoming holiday family gathering. 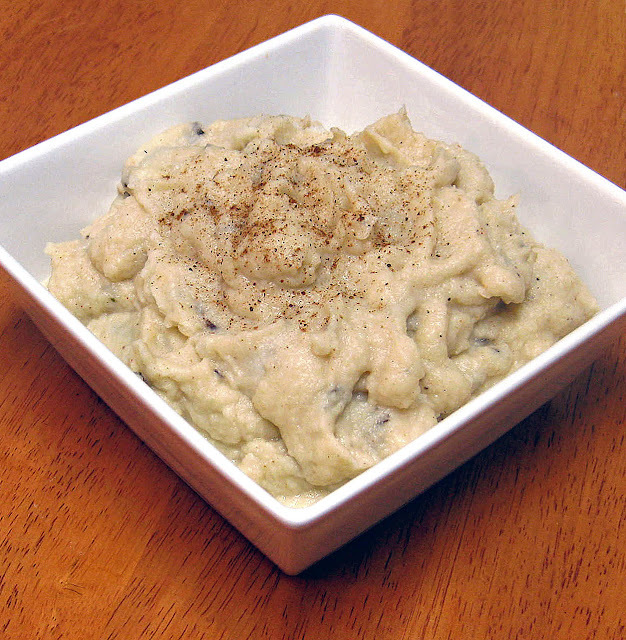 Cauliflower mash makes a great alternative to dishes like mashed potatoes and lots of other not-so-healthy side dishes. In fact, cauliflower mash almost tastes like mashed potatoes (and the consistency is very similar! ), but of course, it's much more nutritious. :) And the great thing about cauliflower mash is that it goes amazingly well with all sorts of main courses, whether they be fish/seafood, meats like chicken, turkey, beef, or lamb), or vegan/vegetarian courses. So, instead of serving starchy, food coma-inducing side dishes like potatoes, stuffing, and rice, try substituting cauliflower mash instead. Not only will you be squeaking a vegetable into the meal, but you'll also avoid eating foods with little to no nutritional value; not to mention, those items can really put on the pounds. ;) For a lot of people, the holidays often mean "starch-fest city," so the less empty calories you eat, the less time you'll need to spend working it off afterwards. :) It's always a great feeling knowing that you can still zip your pants after your holiday meal. Lol. This recipe will appear in the upcoming 7 Weeks to Fitness book, Paleo Fitness. Not only is it Paleo, but it's also vegan, vegetarian, kosher, and gluten-free as well. :) It contains Omega-3-rich walnut oil, instead of butter or olive oil. (The Omega-3's in walnut oil are great for reducing post-exercise inflammation. Olive oil only has Omega-6's, which don't provide the same type of benefits.) The funny thing is that the walnut oil in this dish doesn't even taste like walnuts. It just makes the mash taste creamy and delicious! Directions: Preheat toaster oven to 400°F. Place unpeeled garlic clove onto a small piece of aluminium foil, then drizzle with a small amount of walnut oil. Completely wrap garlic in foil, then place onto toaster oven tray and roast in toaster for about 25-30 minutes, or until golden brown. Meanwhile, place a steamer basket into a large pot, fill it with water until it reaches the bottom of the basket, and then bring to a rolling boil. Then add cauliflower florets, cover, and boil for 15-20 minutes, or until cauliflower is tender. Turn off burner, then pour cauliflower into a colander, and drain. Let it rest there for 1-2 minutes to dry. When garlic has finished roasting, remove it from toaster oven and let cool for 5 minutes, or until cool to the touch. Then peel and mash garlic. Measure out 3/4 tsp. of the mashed garlic, and place this amount into a food processor, followed by the steamed cauliflower. Add remaining ingredients, and process until fluffy. Serve immediately. Chef's Notes: You can find walnut oil at places like Whole Foods, etc. And although I haven't yet checked, there's a good chance that places like Wegman's and Trader Joe's might also carry this item as well. Due to the quantity of cauliflower and/or the size of your food processor, you may have to process the cauliflower a few florets at a time, and then add the remaining ingredients after that. What's to Come: Books, Books, and More Books!